Mapping Time: illustrated by Minard’s Map of Napoleon’s Russian Campaign of 1812. First edition. Redlands, California: Esri Press, 2014. 159 p. $33.50. Earlier this month, a friend of mine, a Digital Humanities Librarian, saw Menno-Jan Kraak’s Mapping Time: illustrated by Minard’s Map of Napoleon’s Russian Campaign of 1812 laying on the passenger seat of my car. He glanced at the title: “So, this book is about this one visualization,” he asked, amused? Kraak’s book is NOT about a single visualization, namely Charles Joseph Minard’s map of Napoleon’s Russian Campaign. Rather, Minard’s exemplary map was Kraak’s partial inspiration for writing a book that discusses the challenges of depicting time on a map. Minard’s map, and many derivative versions, serve as the main illustrations used to explore these ideas. Considering this, Kraak’s book is perfectly titled. Admittedly, however, I too misread or misinterpreted the title. It wasn’t until the middle of the book that I understood the title’s correct (and now completely obvious) meaning. If anyone else makes the same mistake, they should not count on the preface or introduction to set them straight. Even after reading the entire book, I did not feel the preface or introduction explicitly state what readers can expect. This ineffective framing of the book’s content in the introductory pages, however, seems to be its only flaw. Mapping Time contains over 110 maps, according to its preface. Most of the maps illustrate some aspect of Nepoleon’s Russian campaign, which is used as a running example to explore depictions of spaciotemporal information. Mapping Time seeks foremost to discuss the difficulty of representing the dynamic and multifaceted concept Time within a largely static medium. Kraak succeeds in this by sharing concept models for time and how time relates to objects (e.g. people; resources), location, and attributes (e.g. number of units; temperature). Animation and other interactive technologies are also explored; Kraak notes, however, these are not always better at relaying temporal concepts. In Chapter 6, Kraak reflects that time can be mapped effectively by using multiple techniques (and technologies), but that a single technology combining these techniques has yet to be created. Kraak also attempts to tell the broader story of map creation and its accompanying decision making process. He addresses “map basics,” reviewed mainly in Chapter 4, through a temporal lens. This approach makes Mapping Time an effective text for extrapolating and understanding more general cartographic concepts. Kraak adds yet another lens through which to focus his analysis: the problem of mapping a complex narrative like Napoleon’s March towards and retreat from Moscow. Napoleon’s campaign, during which his total army was reduced to less than 2.5% of its size (422,000 to 10,000), provides an excellent example of various time-object-location-attribute relationships. The maps in this book are used to show ways of illustrating answers to specific questions like, “When did Napoleon suffer his greatest losses,” and more general questions about why Napoleon was so unsuccessful. Although the book is rich in subject specific vocabulary, the book does not assume prior knowledge of geography or cartography. Although the book is a short 141 pages, and the illustrations are numerous and attractive, the content is far too dense and practical for a “coffee table book.” It is, however, easily understood and appreciated by an outsider or novice like me. Kraak is careful to note that emerging technologies have democratized map making by enabling people who do not possess cartographic skills to create their own maps. Maps can be used as visual aids in all disciplines. The current and emerging technology has now made creating maps more interdisciplinary as it has blurred the lines between map making and data visualization. 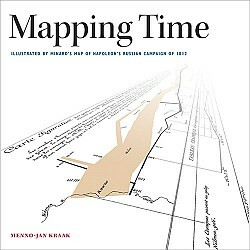 Considering this, Mapping Time would make an excellent text book for a course designed around temporal aspects of cartography, geovisualization, or data visualization, or as a supplementary text for introduction courses on cartography or data visualization. Furthermore, Mapping Time would be an excellent addition to most academic libraries, especially those that provide patrons with digital humanities services and those supporting curricula in geography, cartography, GIS, history, information science, migration studies, and other fields in which time lines or depictions of change over space and time is crucial.